This series of articles entitled CONNECTED SPEECH 101 is part of the Human Communication 101 series of introductory-level articles. As the word-final /b/ is adjacent to a neighboring silence (i.e. the end of the word) it appears to assimilate the voicelessness of this silence, thereby de-voicing the phoneme to create the allophone [b̥]. As with the occurrence of velarized-l in word-final position, the de-voicing is not a product of word-internal factors but the silence at the end of the word. To reiterate, all of the phonetic variations described in Allophones 101 affect words spoken as single units. It is self-evident, however, that we do not typically speak using words in isolation. Rather, we string together a series of words in a verbal stream that we call connected speech (sometimes called running speech). As one might expect, there are several more-or-less predictable pronunciation changes that occur in connected speech. 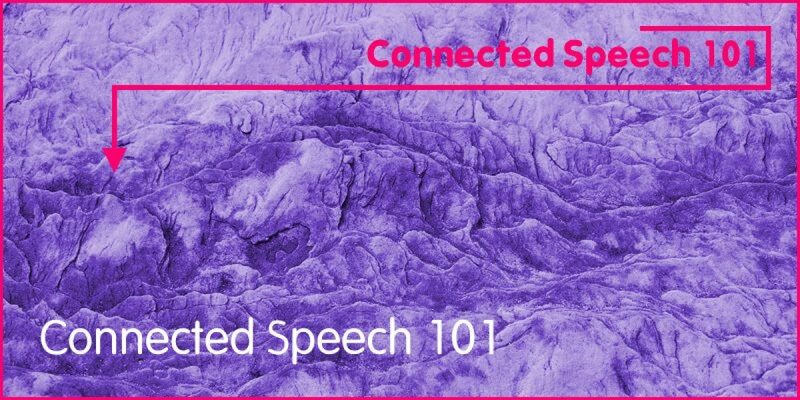 This series of articles entitled CONNECTED SPEECH 101 examines some of these changes. CONNECTED SPEECH 101 assumes knowledge and understanding of allophonic variation as set out in Allophones 101. This, in turn, presupposes an introductory level understanding of articulatory phonetics as described in English Speech Sounds 101. If you are having difficulty following any of the concepts in Connected Speech 101, we suggest that you revise the earlier introductory series that contain all necessary information.